The ShelterLogic 10 x 20 ft. Pop-Up Canopy delivers 200 square feet of coverage. The expansive truss top design combines quality construction and showroom good looks in one ready-to-go unit. Get wind protection or added privacy with the wrap-around wall panel from Quik Shade. This convenient added wall panel provides a private zippered entry into your canopy unit, converting it from a standard canopy into an attractive tent or enclosed temporary buildings. Attaches easily to your canopy frame with hook and loop fastener straps - no tools required. Adapted for W100, C100, SX100 and most other Quik Shade 10 x 10 ft. straight leg canopies. The ShelterLogic 12 x 30 Super Max Canopy Enclosure kit allows you to expand Your canopy options. Quickly convert your Super Max 12x30 canopy into a functional, low cost, fully enclosed seasonal shelter in minutes. Complete ready to install kit attaches in minutes to your existing frame with bungee fasteners. All constructed to the exact frame specifications of the 12x30 Super Max Canopy and Frame not included. The Super Max Fire Rated canopy enclosure kit delivers more options to turn your canopy into a functional, low cost enclosed seasonal shelter in minutes. The easy to install enclosure kit includes two side walls, one fitted back panel and one double zipper front door. Made of Fire Rated polyethylene fabric which is heat sealed not stitched for strong bond and 100% waterproof. 10 ft. x 20 ft. Pro Pop-Up Canopy with Straight Legs & Purple Cover The ShelterLogic 10 x 20 ft. Pop-Up Canopy delivers 200 square feet of coverage. The expansive truss top design combines quality construction and showroom good looks in one ready-to-go unit. 10 ft. x 20 ft. 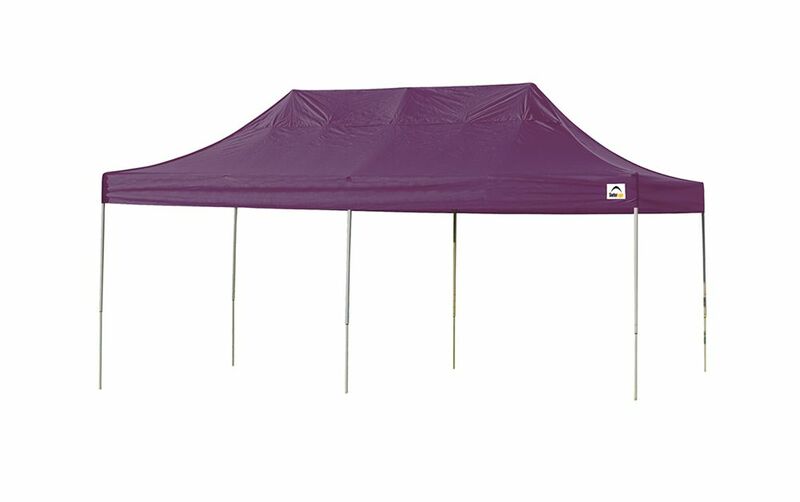 Pro Pop-Up Canopy with Straight Legs & Purple Cover is rated 4.0 out of 5 by 4. Rated 4 out of 5 by Rezrev from pop-up canopy good quality This canopy is made strong and provides good shade. It was lacking in good directions and the six stakes are not sufficient to properly ground the canopy in windy conditions. Advice on how to raise or low legs would have been quite helpful. The video on their website was not thorough enough to provide adequate advice for one without an engineering degree. Rated 4 out of 5 by DB51 from Looks better than expected. I like this product and used it to cover my boat over two docks. Although the product could be simple to install I had problems with burs when inserting one tube into another. Also most ends had a build up of paint that made assembly difficult. The product is sturdy and has done well in the winds off the lake. Overall it was well worth my investment. Rated 4 out of 5 by HomeDepotCustomer from Awesome. works like it should. Wasn't expecting to have to assemble it. Also, having to disassemble it to store/travel it. It is very sturdy & durable. The venting along the top to keep it from becoming a kite works great. It is pricy for what it is. If it was $100 less, you'd sell alot more.